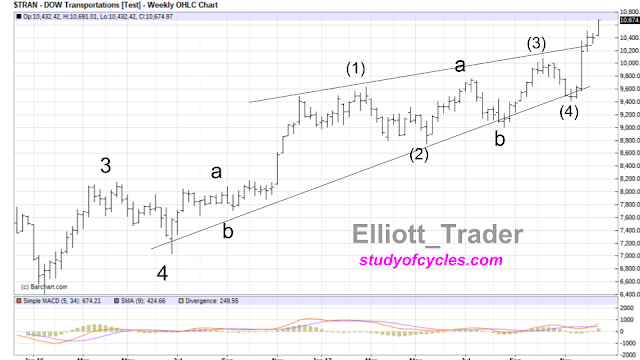 Below is a year ending Elliott Wave Analysis. The upcoming year could be a very important one in terms of turning points. Enjoy the video, but most importantly have a safe and happy end to 2017, and a great beginning to a brand New Year! The market, as measured by the S&P500 cash index closed yesterday at 2,688. The futures were higher overnight, and actually made a new all-time high. So, the cash market opened up a point to 2,689, then traded higher to 2,692 but did not make a new all time high. At that time prices started reversing lower in an initially choppy session. But toward the end of the session, the down draft gained steam, and the market closed lower at 2,675 - down 14 points, and closing one gap in the process. Now, it's a question of who do you want to believe: the futures or the cash? The futures traveled down far enough to overlap the first wave in the impulse count below, after making the new all-time high. Cash neither made the new all time high, nor overlapped downward. So, it is possible to count the up wave as completed, with the new all-time high, and the down wave started with the overlap. Because we can at this time only count three downward waves, we do need to see five clear downward waves form, and a retrace that sticks without making new all-time highs to see a downward count properly unfold. 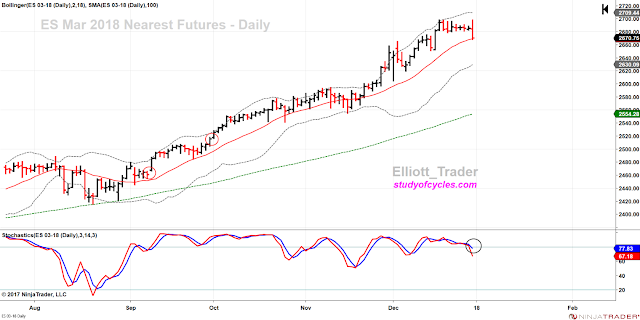 The Daily ES E-Mini S&P Futures lost the embedded slow stochastic reading, as in the chart below, with today being a clear outside reversal day down. If the 18-day simple moving average (or SMA) gives way, then the lower daily Bollinger Band could be a target (not trading or investment advice - just a paraphrase of what Ira Epstein teaches). So far, prices stopped right at that "line in the sand". Very interesting! It is also interesting that the daily cash S&P500 Index chart has no cash gaps above the current price! I may have a few more observations this weekend. Until then, have a very good start to your weekend, and to your New Year's as well. 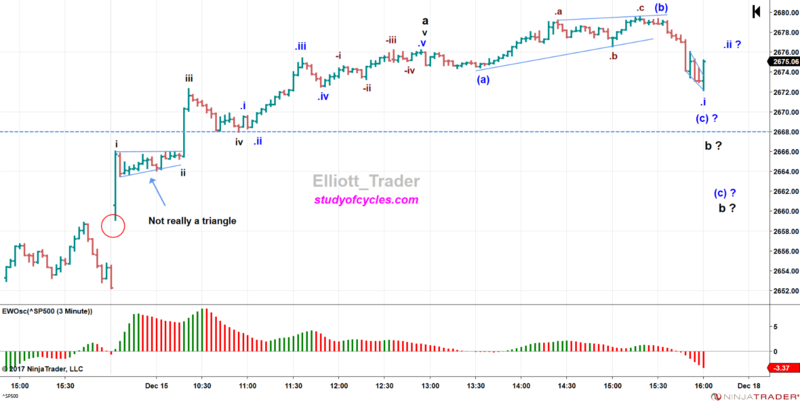 In another quiet trading day, nothing has changed to invalidate either the potential contracting ending diagonal scenario or the impulse count with the fourth wave triangles. The market as measured by the S&P500 Index had closed yesterday at 2,682. The futures were higher overnight, and so the market opened with a four point gap to 2,686, and traded up as high as 2,687 where it met resistance, and turned abruptly lower in three waves to 2,683 although the opening gap was not closed by fractions of a point. Prices then drifted sideways and tested the lows before the final hour in which there was a small rally that allowed the market to close at 2,688. To keep things simple, here is the same chart of the ES E-Mini S&P500 Futures, on a four-hour basis, that was shown yesterday. Again, based on this chart, the triangle is either the fourth wave of an impulse, or it is the b wave of the wave (v) in the diagonal count. At this point, measurements are acceptable for both, but the impulse count has the best look to it. In this count, the (c) wave of the triangle would be the complex wave. The (d) wave might try to hit that upper trend line boundary. This is a clear example of how exactly the same wave structure can result in alternates. And, there is nothing we can do about it because we are in The Fourth Wave Conundrum - which happens at every degree of trend. If, and only if, the triangle invalidates, we will look to a different wave structure, such as the market having topped at the wave ((iii)) location, or a larger wave b, downward. Again, the market may be hobbling over to that January 2nd date, pending the fresh inflows of cash. So keep an eye on things, and keep your attitudes patient and flexible as we approach the New Year. Nothing has changed to invalidate either the contracting ending diagonal, or the potential contracting triangle. The market as measured by the S&P500 Cash Index had closed yesterday at 2,680. The futures were slightly higher overnight, and so the cash market opened up slightly to 2,682, and traded higher to 2,686 before trading lower to 2,679, and then reversing mildly to close at 2,682, up about two (+2) points. The lackluster trading volume (with ES below 650k contracts), and flat Elliott Wave Oscillator can be indicative of a triangle which is waiting for year end. This can be best seen on the ES 4-Hour Futures chart, below. Today the futures made a lower low than yesterday (although cash did not). This suggests the (c) wave of the current triangle is the complex one in the futures. It is possible the triangle is trying to extend the rally, waiting on the new money which is often provided by the first trading day of a new month, and, in this case, a new year from things like company year-end bonuses, dividend reinvestment plans, 401k's, pension accounts, etc. There are no guarantees with potential triangles, and like all potential triangles, this one must prove itself, too. This triangle would invalidate below the low 2,679, the prior (a) wave. And a downward fourth wave would invalidate itself with an overlap of wave ((i)). 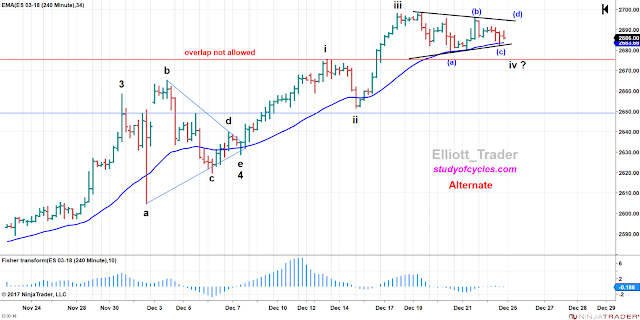 If the triangle invalidates, it could suggest that the diagonal was already completed at the location of wave ((iii)) - as previously described - or a larger b wave is forming within the potential diagonal. Again, the preference for the triangles right now, rather than the diagonal, is they have more of the right look at this point in time. But, if the triangle holds as is shown above and is exceeded higher, we would likely have two contracting triangles at two different degrees of trend which would likely spell the termination of the rally - at least for the time being. So, even though it's the holiday, it is still time to be checking in at least loosely with the market and the overnight futures to see how the wave count is progress. So have a good start to your evening and we'll see how things go tomorrow. Due to the proximity of Santa's Sleigh, I thought it would be most appropriate and helpful to provide an update of the Dow Jones Transportation Index. You can almost see Rudolph's red nose, can't you? Have a very wonderful Christmas, Kwanzaa, Hanuka, Boxing Day or other Holiday, and thanks for all the support during the year! In a very weak confirmation of yesterday's inverted hammer candle, stock prices closed only slightly lower. As measured by the S&P500 Index, cash had closed yesterday at 2,685. By the opening, the futures were largely unchanged, and the cash market went on to open up slightly, but could not fill one of the running gaps we noted yesterday (this one at 2,685.64), and that gap remained opened all day. So cash went on down to trade -8 points lower at 2,678, before trading sideways to higher to close at 2,684, or largely unchanged, creating a Doji in the process. The ES futures volume was probably the lightest of the year at 584k contracts - even lighter than most holidays. Because of the drifting price movement, the ES is beginning to look suspicious again. And, even though the diagonal we posited over the last several weeks has not formally invalidated, I was able to find a count with my original triangle idea which may prove informative. The chart is below, and it shows the ES 4-Hour time frame. In this count, the symmetrical triangle looks to have better form to make wave 4, and the current proposed smaller degree triangle alternate wave iv, above, would have to not overlap wave wave i. Keep in mind this triangle could also be a b wave triangle within the proposed diagonal, provided that the diagonal does not invalidate in terms of price. This alternate might be a good way to get the S&P500 Cash Index to cross that 1.618 extension mark. So, we will have to watch where the futures go over the holidays. It is still possible we topped at iii, but less likely, as it a lot of time to break lower, and the internal waves are very halting and overlapping. Well, we'll see how it goes. Have a very good start to your holiday weekend. Nothing of substance changed today. In very light holiday trade, the market as measured by the S&P500 Index had closed yesterday at 2,679. The futures were higher overnight, and cash opened with with a four point gain to 2,683. Unlike the last couple of days, the market did not close it's opening gap in the first hour and went on to trade higher during the afternoon to 2,692, up about +13 points. A new high was not made, and the upward wave did not retrace 90% of the downward movement overall. The potential inverted hammer candle would require a follow-through candle, with a lower close for confirmation. At about 13:00 ET, the market just seemed to say, "well, enough eggnog", and turned lower by fully 10 points to 2983, closing at 2985. With prior upward waves, today's upward wave can be part of complex second wave upward, or it can still be a part of making marginal new highs - although this latter case is becoming increasingly difficult. That is because at the end of the day, there were some deep downward overlaps. This suggests that market is currently having difficulty impulsing higher, and if today's gap up open is filled, a downward turn may be more easily countable. 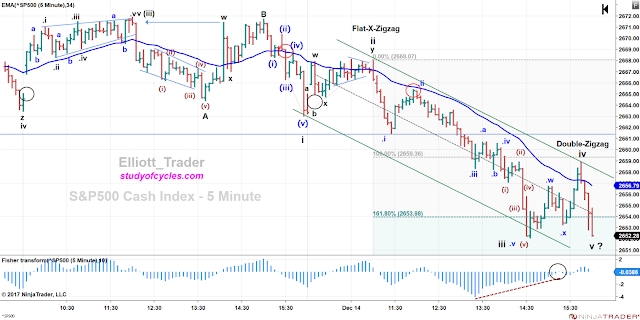 So, that I don't confuse you, but provide you with the maximum information possible, I have removed all wave labels from this chart, except some of the waves made today and yesterday on the S&P500 Cash - 15 Minute chart. Here you can see we started counting the uptrend in a channel, as either A,B,C in blue, or 1,2,3 in black. 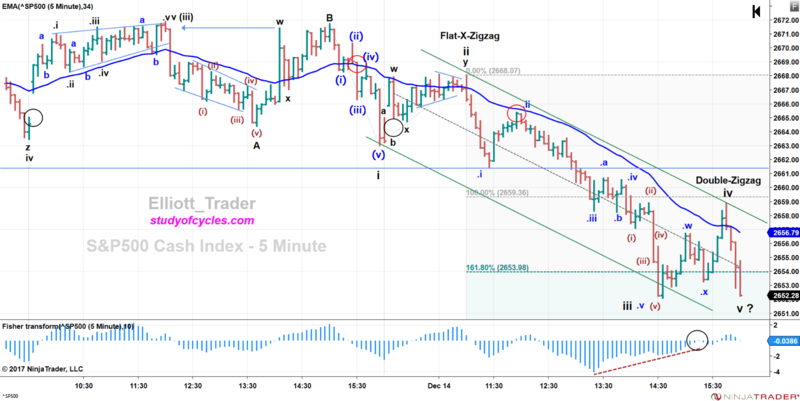 Towards the end of the session, the market fell rather deeply out of the channel and overlapped part of wave 2, or wave B. This violates a guideline for counting an upward impulse, but does not break a rule. Wave 1 or A upward simply was not overlapped in the downward direction (yet). Still the formation looks quite weak and may be part of a complex flat second wave upward. 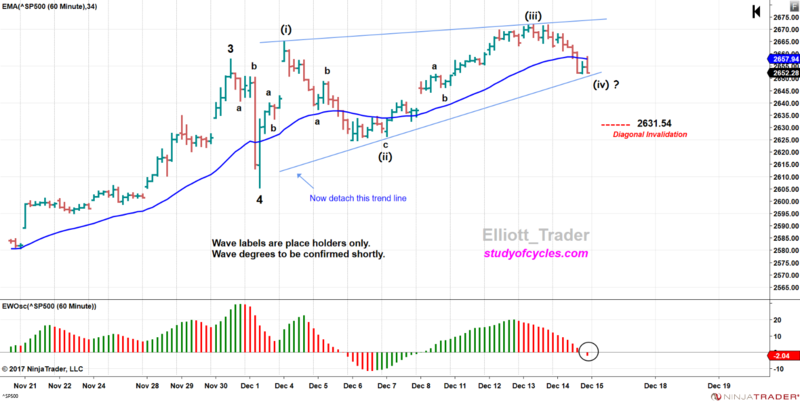 The afternoon's downward wave did create some some "running gaps", circled in red after wave 3, or C, and this may signify a the beginning of a third wave lower. But, the jury is still out. More credence to that case will occur if 1 / A is overlapped in the downward direction, and certainly if wave 2, B is exceeded lower. There are still ways to manage to make marginal new highs (even with this messy count), but to avoid confusion discussion of those will be put on hold temporarily. There is even one way to count today as a truncation top, and it involves a messy prior triangle B wave of the ending contracting diagonal. So, bottom line, we must continue to have patience and be flexible until we see what this wave has in store for us. We are clearly showing you the wave that can be interpreted in two ways at this point, and that is the resolution we must wait for. Have a very good start to your evening, and a good beginning to your holiday travels if you are headed out that way tonight. The futures were higher overnight on likely Senate passage of the tax bill. The market as measured by the S&P500 closed yesterday at 2,681 and opened (+7) points higher at 2,688 and traded up to 2,691 before quickly reversing course to close the opening gap in the first half-hour. Many markets today did make lower low days which will turn their daily swing-lines lower. This included the DJIA, the S&P500, the ES E-Mini S&P500 Index futures and the NQ futures. While this is not overly detrimental to the market yet (because of the narrow point loss), the new daily lows - with lower highs - are to be respected. The S&P500 cash got down to 2,676, before trading sideways to close at 2,679 - down just two points. In this regard, the ES daily slow stochastics have not traded below the 80 level, as of yet. That is something to watch. 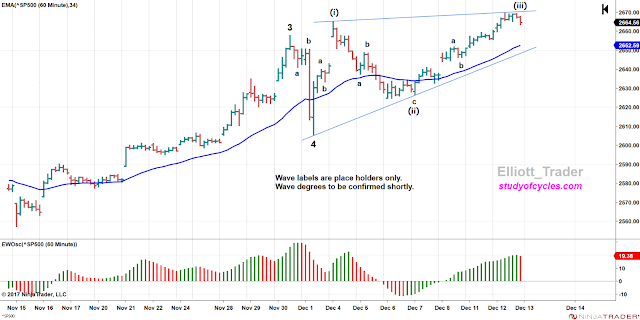 While we have a downward count working in the chat room, price has not created sufficient downward overlaps yet to conclude that a Minor 4th wave is unquestionably underway. However, the 1.618 Fibonacci extension on the weekly chart is literally points away, and the count below respects 1) that Fibonacci relationship, 2) the high point on the Elliott Wave Oscillator (EWO), 3) the degree labeling of each of the waves, with the minute waves smaller than the minor waves, and the minuet waves smaller than the minute waves, with 4) an extended first wave for minute ((i)), with minute ((iii)) and minute ((v)) being smaller than minute ((i)), and 5) the large hourly triangle we had, and diagonal which may be now over. There would be nothing wrong with marginal new highs provided the hourly diagonal is respected. But, these are not required for a completed count to Minor 3. In the count above, you can also see that all of minute ((iii)) is now above a line from Minor 2 to minute ((ii)), thus meeting another one of Neely's guidelines. The alternate count for the above chart would be the Expanding Ending Diagonal (or fifth extension terminal) which I both originated, and have shown before. But, I will not switch to that interpretation until or unless price warrants it! Have a very good start to your evening, or to your holiday travels if you are heading out on the road for the holiday! Yesterday we said, it might be possible to count "five up" in the NQ futures, and showed that it was bumping up against it's wave three parallel. Today's chart shows an "outside key reversal down" - this as the Republicans voted to endorse the new tax plan. Here is the updated chart. The overall count has not changed. This is a market to keep an eye on in the short run. Should this and/or other markets start making further lower daily lows, it is not something to ignore. From the standpoint of the ES E-Mini S&P Futures, and the S&P500 Cash Index, let's start with the situation in the futures, as shown by the four-hour chart, below. As you can see from the Fibonacci ruler, wave ((v)) of 5 is still shorter than wave ((iii)) of 5, as it should be. So, we 'may' have started down in earnest today. If price re-enters the diagonal, that would be a significant warning sign. The situation in cash is very, very, similar to this. No critical measurement has been exceeded upward. But, we caution, by today's internal count, it is 'possible' for prices to go back up and make only marginal new highs again. That is because, as you can see above, there are only three clear waves down from the high. Perhaps this would happen on an announcement of the passage of the tax bill by the Senate. We don't know for certain. We can only say "a completed up count is possible in two markets at this time". If marginal new highs are made, it would likely be the c wave of ((v)) making an ending diagonal in itself. It is also possible for the market to gap lower tomorrow and extend a third wave lower, then add a fourth and a fifth wave to complete a true impulse lower. That's the nature of the beast at this time, so monitoring of the overnight futures is again highly recommended. While I'm sure there are many questions still, let me just add that in no way can wave ((v)) in a diagonal travel below wave ((iv)), so that price movement beneath wave ((iv)) likely means that the diagonal has been completed. Please stay patient and flexible: the longer term implications can be decided once we know if a diagonal has completed properly. On a technical note, the $VIX made an outside day, up, today, and ES volume shrank to under 980k contracts. Cheers and have a good start to your evening and holiday travel if you are headed out of town. Nothing has changed, invalidated or is out of limits as of this writing. Here is the latest on the NQ futures. 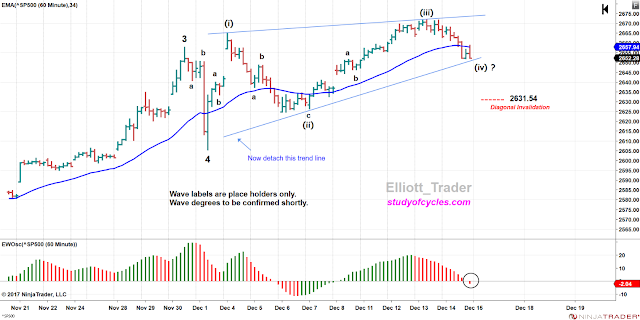 Wave (5) is becoming quite parallel to wave (3), often the target for a fifth wave. In the chart below, wave (3) is slightly longer than wave (1). The Russell 2000 may have expanded the (d) leg of it's triangle today. It did not go over the top. Regardless, the blue arrow at the end of the chart points up and not down. The ES futures volume is again getting quite light - today at only 1.0 MM contracts - which is more reminiscent of holiday trading. Looking at the chart below, I can't help but wonder if the Russell 2000 Futures aren't making a year-end triangle as the other markets are making a potential diagonal wave. The purpose of such a triangle is generally to better equalize the length of wave iv, with the length of wave ii, and to provide alternation to it. Wave ii is a short sharp, so wave iv could be a longer flat or triangle for alternation. As of this writing, there is no downward overlap yet, and a triangle could be seen as (a),(b),(c),(d),(e) as labeled. You can see from the chart, wave ii was roughly 25 points. And if a wave iv ended at the location of (a), then it would have been almost 60 points. So, the purpose of a triangle would be to try to narrow the overall point gap between the two. If a triangle is forming, then although the first wave down to (a) looks like a mess, it can be counted as a simple a-b-c with a as a leading expanding diagonal, and c as a very clean impulse. Then, the (b) wave up of the triangle would be the complex leg, formed of two zigzags w-x-y. Then, the remaining legs should be simple zigzags. It does look as though in order to maintain its contracting shape the (d) wave is done or near-done. But, then, for a "running triangle" - with a higher (b) wave - to form properly, the (e) wave must come down to cross back over wave iii before the final thrust out of the triangle. Running triangles must contract, and they must have their (e) waves cross back over the prior motive wave, iii, in this case, or A, in the case of a zigzag. The triangle in this form would invalidate with any movement below the (c) wave, with a more complex flat as an alternate. One of the reasons the chart is interesting is that a triangle usually comes before the last wave in the series, and a target of v = i, or less could be projected to make a slight new high. Hope this helps, and have a great weekend. With the possibility of yesterday's truncated fifth wave (called out for you in near real time), an up wave was expected, and that's what occurred (the ES futures had made a lower low overnight, then turned around higher). The market as measured by the S&P500 Index closed yesterday at 2,652, and opened at 2,661 a nine (+9) point gap, then traded as high as 2,680, before turning slightly lower (down -8 points to 2,672) and turned around toward the close to end the day at 2,575 up +23 points. Because there was no significant retrace within the up wave, it does not have the typical characteristics of an impulse in a channel (i.e. following The Eight Fold Path Method). When you see waves that "fly off the handle" like this, they are typically A waves or C waves. This one appears to be an A wave. First, let's look at the very detailed internal count we did today on just today's wave in the chat room. After the gap up wave, there was less than a 23% retrace. That usually means we are still in the same impulse wave upward. We were right; the impulse continued to make five non-overlapping waves up. We are showing you this in an amazing level of detail. Then, when wave iv occurred, it was larger than the previous down wave without overlapping the top of i. This meant it had to be iv, and not ii of a 1-2-i-ii up at that location as that would have resulted in a degree violation. Not allowed. Then, after wave iv broke the 0 - to - ii trend line, that signaled wave v in progress. And it chopped, and it chopped higher. In then end, within the a wave, wave v was shorter than wave iii, which was shorter than wave i. Another one of those extended first wave sequences. And now, the question is, "is the down wave over?". The downward wave ended in a diagonal. Is it all of an ending diagonal (c) wave, or just a Leading Diagonal .i of of a larger (c) wave of b? For that, you have to pay close attention to the overnight futures and see if the highs break. In any event, we still expect some upward price movement is possible. Let's now have a look at the hourly chart of the cash S&P500 Index. S&P500 Index - Hourly - Potential Diagonal Currently Has "The Right Look"
Even though this potential diagonal has "the right look" at this time, including a characteristic throw-over of the upper boundary, it still has to be monitored to be sure it completes properly. As it is, this upward wave has a higher all-time high, but it is also on a divergence of the Elliott Wave Oscillator (EWO). Note that for proper completion to occur, then wave (v) must be shorter in price than wave (iii) from here. But, the b wave down can do almost anything it wants, as long as it does not drop below wave (iv). It would be a real good exercise for some of the readers to post the upward invalidation point and leave it in the comments. I will cross check over the weekend. Which reminds me: time to start that weekend, so have a very good start to yours! P.S. As of this time, the futures high has broken which means either b is done, or a more complicated b wave is in progress in the futures. As per yesterday's blog post, today was expected to be a down day and it was in the S&P500 and most other major averages. The market, as measured by the S&P500 Index, had closed yesterday at 2,663. Overnight the futures were slightly higher on some of the European Central Bank announcements, so the market opened with a small three-point gain at 2,666 and traded up to 2,668 without filling it's gap. The DOW made a new all-time high, while the S&P500 did not. At 11:00 AM the down turn took hold and stocks essentially traded lower in an impulse channel until the end of the day. First, let's have a look at the potential hourly ending diagonal on the cash S&P500 Index. So the first expectation was fulfilled. Price traded below the hourly EMA-34 to likely make a much more proportional diagonal (than the non-proportional triangle we cited earlier). A diagonal at this level would have excellent form and balance. So, again, just like a triangle is defined by it's (a), (c) and (b), (d) trend lines, so too is a diagonal defined by it's wave (i), (iii) and (ii), (iv) trend lines. Therefore, we detach the wave 4 anchor if this or something close to it is to be the diagonal. And, we just draw the lower trend line from wave (ii) to wave (iv). Period. It's that simple. Next, we measure wave (ii), and subtract that measurement to the top of wave (iii), and a price of 2,631.54 is obtained for an invalidation level on the diagonal. Beyond that, the alternate flat count would take over. So far, we note above that we have obtained a wave four signature on the EWO with a shallow break of the zero line, so far, within +10% to -40%, meeting expectations. Next, for your confidence this Holiday season, I will show you the five minute chart of the S&P500 Cash Index we counted out in the live chat room - turn by turn, wave by wave. One reason to be reasonably confident about today's down turn starts over on the left hand side of the chart. Yesterday, we were able to count out a completed smaller vth wave ending diagonal of wave (iii) in perfect form. Prices then turned lower around noon, and made another grinding lower structure, which we were again able to count out as a contracting leading diagonal A wave. Next, on the FED announcement prices spiked higher in the w wave of a double zigzag and filled the small running gap they left by leaving the diagonal in such a hurry. After prices failed to make a new high, and started heading lower again, we counted out yet another diagonal, this one an expanding leading diagonal as (i), (ii), (iii), (iv), (v). Since it would be poor alternation to have two first waves as diagonals, we surmised that yesterday's first ontracting diagonal down was an A wave, the deep retrace was a B wave, and the second expanding leading diagonal was a first wave of an impulse lower. At around 11:30 AM today, prices broke through the prior low and we began counting the impulse you see in the channel looking for alternation at each turn. Wave ii is a clear sharp and wave iv is a clear flat. Less straight forward was wave ii as a Flat-X-Zigzag, and wave iv as a double-zigzag. 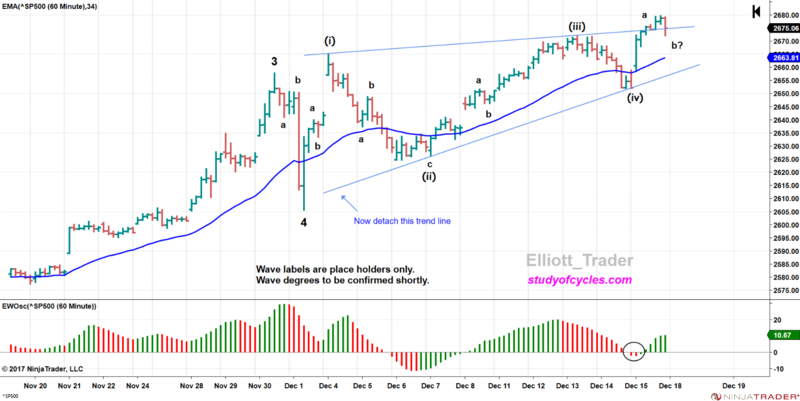 Within wave ii, the first b wave makes a 90% retrace which is the only reason it alternates with wave iv - whose first b wave does not make a 90% retrace. Further, you'll note that wave iv comes back exactly to the second wave (ii) of the extended fifth wave of the third wave. That is just as it should be! Regardless, wave iii is outside of the lower channel boundary to express it's momentum, lower, and wave v has come down to within 0.2 of the prior low - enough for a fifth wave, but maybe not all of it. And, it is currently on a divergence with the oscillator shown. Yes! It's possible (but not required) that if this wave down is to remain a zigzag A-B-C, then the fifth wave of C may indeed truncate slightly. But, it is very possible a lower low will be made tomorrow without harming the pattern. A truncation would be an excellent sign of a fifth wave (v) up, of a diagonal, if it is to occur. So keep an eye out for overnight developments. 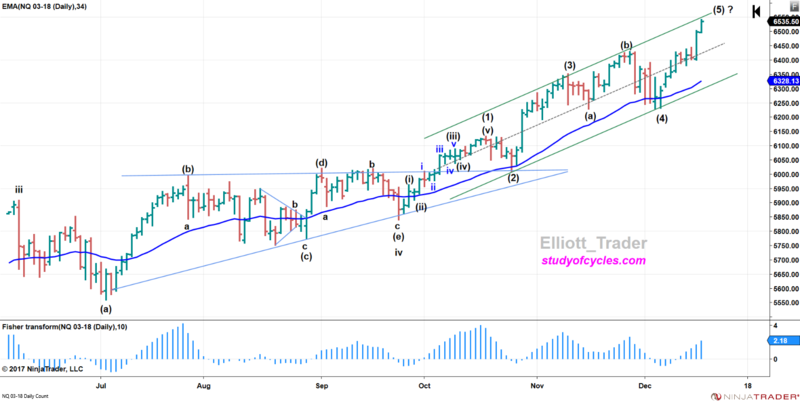 We will also note that after the Dow made it's new all-time-high, as wave (iii), it has maintained it's diagonal parameters as well, and has since downwardly overlapped it's wave (i), as well. 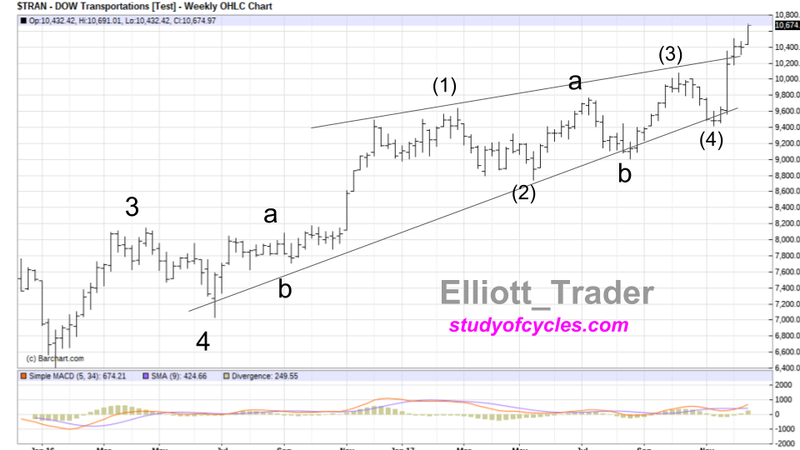 Can this diagonal invalidate and just form the larger FLAT wave 4? Yes, it is possible. 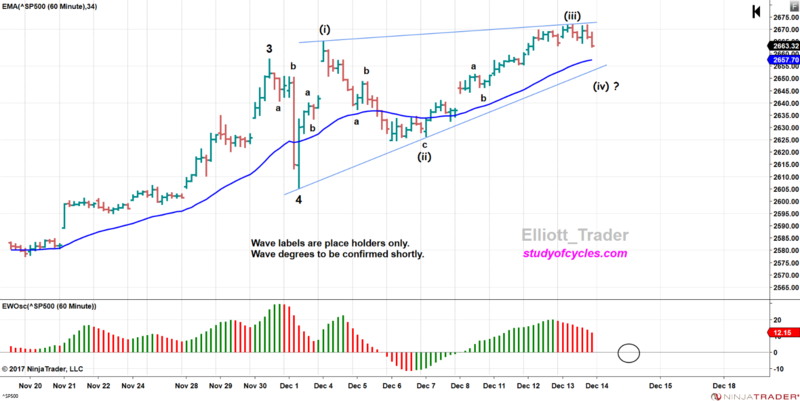 In that case, the A wave would indeed be a first wave 1. But, at this point in time there is no evidence for it yet. And one piece of counter evidence for that flat, was yesterday's ending diagonal on the left side of the chart. Notice that although it's low was exceeded yesterday, it was not exceed in less time than the diagonal took to build. Could that mean there is another high ahead? Inquiring minds want to know. So have a very nice start to your evening. Yesterday we said a gap up would be a great way to finish the fifth wave .v, of c of diagonal wave (iii). After being lower overnight by about six points on the announced Republican loss in Alabama, the ES futures then turned around to higher before the open of the market. As a result, the cash market as measured by the S&P500 Index did open with a two-point gap higher, and traded up to 2,672, a new all time high, prior to the FED announcement on interest rates. Then, the market began a slow, but volatile fade lower, spiked on the FED announcement to almost tie the high, and finally headed downward at the end of the session to close a point lower at 2,663. The cash market thus had an 'outside key reversal day down', but the ES futures did not as they did not take out the overnight low. The hourly chart of the potential ending diagonal remains below. So now the cash index would now be expected to cross below the hourly EMA-34 shown in blue. If or when it does, remember that a diagonal wave is defined by its waves (i), (iii) and (ii), (iv) boundaries. So, we can not know the exact shape of the diagonal until we know where wave (iv) has ended. At this length wave (iii) is less than wave (i), so the diagonal measurements are still working out well. For wave (iv) to form properly in a contracting diagonal, it must remain shorter than wave (ii) and, obviously, it could not then cross beneath the wave (ii) terminus. It has already overlapped wave (i), down, so that part of the hard work is done. 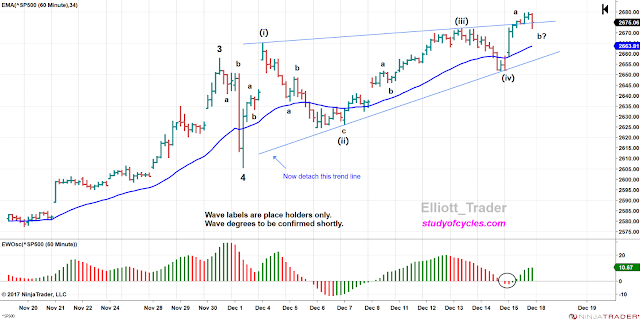 Again, as per yesterday's blog, if wave (iv) should become longer than (ii) and / or break beneath the lowest low of wave (ii), then one might consider that a much larger and more complicated flat was developing and, in that case, the retrace down to the prior wave 4 would be the best alternate. We'll only post that chart if the current wave structure breaks. Should things remain in tact, and you are looking to know what wave (v) should be like from a wave counting perspective, then, first, it must remain shorter than wave (iii). Second, it must form a zigzag. It is all right if the b wave of that zigzag is a flat or triangle, but there must in the final analysis be a zigzag visible in the structure. And, third, since a lot of people are tracking this one - yes, it can fail. A failure or truncation, if we should get to that point might really give us pause that a larger down move is coming, so now is the time to pay very, very close attention. Other than that, have a very nice start to your evening. As we suggested in the prior blog posts, one way or the other, the market was likely headed higher - whether it was the breakout of a triangle (with poor proportions) or the formation of a larger triangle or diagonal. The market as measured by the S&P500 Index closed yesterday at 2,660. It gapped up two points at the open to 2,662, then filled the gap within the first fifteen minutes. Then, it headed higher to 2,670, the high of the day and made a new all time high, before trading sideways and lower to close at 2,665. Because of the higher closing hourly highs, it seemed best to slant the upper trend line upward, as in the following chart. With today's price movement, a potential wave (iii) of the a diagonal is nicely forming. There is nothing here (i.e. no significant downward overlaps) that says wave (iii) upward is over yet. The red bars at the end could just be wave .iv of c of (iii), and a gap up tomorrow could fill the bill to finish the wave before the all-important FED meeting. 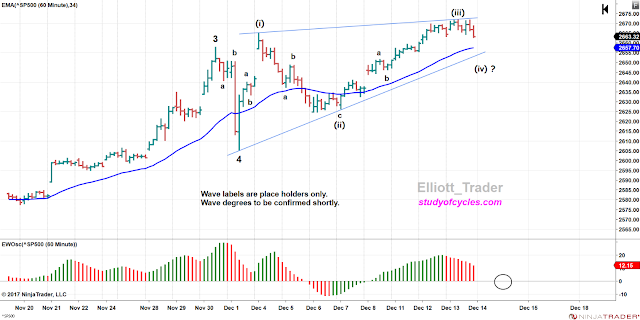 We note wave (i) is on a divergence with 3, and wave (iii) is on a further divergence with both waves 3, and (i). For now there are three cautions. First, of course, wave (iii) must remain shorter than wave (i). It's OK now, but keep your eye on it. Second, if wave (iv) starts tomorrow, it may not travel below the low of wave (ii). If it does, then the diagonal is converting to a much larger and more complicated flat wave. The third caution is this. We have seen many contracting ending diagonals before. And we have seen them where the third wave is longest in time too. This one may be no different, but, often contracting diagonals contract in time, too. So, the caution is that a diagonal may not work out for that reason. If it doesn't, there is nothing we can do about it. We ARE in the Fourth Wave Conundrum. And, you may have just seen a fine example of how a potential triangle shape can morph into a potential diagonal shape. For form and balance (unlike the poor proportions of a triangle we noted yesterday), it would be best if potential wave (iv) traveled below the EMA-34, and if the lower upward sloping trend line remained somewhat in tact - a few pips under-throw would be fine. 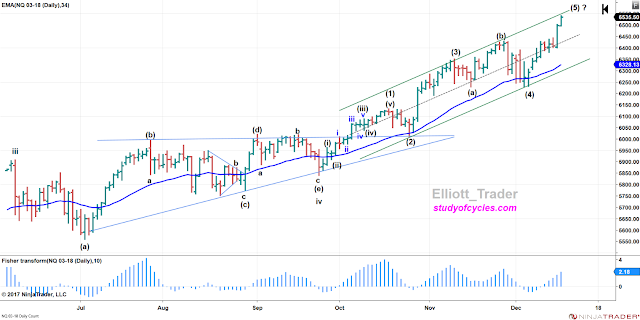 For those who are just learning Elliott Wave, this is a fine example of why a contracting ending diagonal fifth wave is not even a potential until both of it's waves (i) and (iii) are over the high of the prior 3 wave, so that they still express their Motive character - their propensity to travel in the direction of the one larger trend. Please note the wave labels we have assigned on the chart are 'placeholders' only for clarity. We will confirm wave degrees in a subsequent post. For now, it is most essential to understand the characteristics of this potential diagonal, and to see if the pattern is born out. So let's keep it simple. If a diagonal should play out correctly, it would indicate the market has come "too far, too fast" and is due for a very significant correction. But, we will talk more about that once we see how this goes. Until we get a valid ending pattern, particularly if it has the right look, higher highs are still possible. I hope this helps, and have a good start to your evening. After the close of the cash market, the ES E-Mini S&P500 Index Futures went on to exceed their prior high. The Dow Jones chart is below. It still looks (perhaps deceptively) very symmetrical. So, it is 'possible' the SP500 and ES futures will go on to form a 'barrier' type of triangle with tomorrow forming the (E) wave down. BUT is about equally likely that 1) the triangle ended with a very stubby (E) wave today, or still a bit less likely that 2) a diagonal is forming. This is the essence of the fourth wave conundrum. 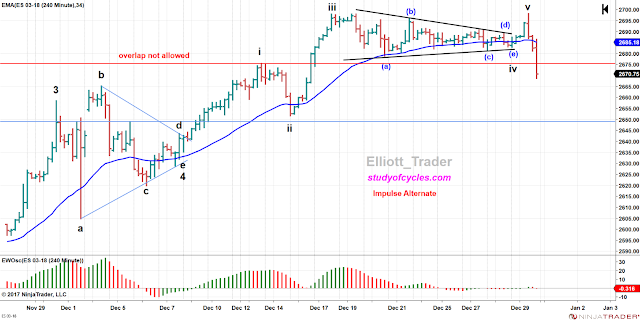 I will show you the S&P500 Index cash hourly count that says the triangle ended below. It is a "legal" count. The reason this count is legal is that wave (D) rises above wave B of the (A) wave, and above the B wave of the (C) wave. And wave (E) drops back down under wave ((3)). This is the key reason I proposed the triangle to begin with. If you look at how shallow wave two is, this triangle would equalize the depth of wave ((2)) and wave ((4)). Let me show you that on the chart, below. The size of the black boxes shows that wave ((2)) and ((4)) would be much more "nearly equal" in net travel if the triangle is considered complete at this point in time. Again, it's not for certain. A slightly larger (E) wave is possible tomorrow. And, with the upward bias, a slightly larger barrier triangle or diagonal wave is not out of the question either. (* For this reason on the above chart, I am not showing the wave 'degrees' accurately represented. I will develop a chart with the degrees properly represented for tomorrow or the next day once we know whether a longer barrier triangle or a diagonal is formed). In any event, the contracting triangle, the potential barrier triangle and the diagonal ALL suggest that higher highs are entirely possible and likely. This is in distinct contrast to certain Elliott Wave web-sites, and a major Elliott Wave Service who's wave counts are adamant that the up move is over by their count. I have written to one such wave service to tell them why their count is incorrect based on incorrect degree labeling. As of this writing, I am still waiting on a satisfactory reply as the ES futures made a new all-time high tonight.